Update: As of January 16, Sears and ESL Investments appear to have reached an agreement to keep the company in business and stores open — for now. Be sure to subscribe to our blog for ongoing insights and analysis on new developments in this story. Is this the end of the road for one of the oldest retailers in the US? After a protracted financial decline exacerbated by a controversial — some might say catastrophic — 2005 merger with Kmart, 126-year-old Sears is out of cash and time. Bankruptcy proceedings that began in October of last year are nearing an end, with an auction for the company’s assets set for today. By Wednesday, Sears expects to review a range of bid offers, the majority of which are expected to lead to liquidation. But there may be some hope. On January 9, Sears Chairman and former CEO Eddie Lampert filed a last-minute, $5 billion bid to buy the company through his hedge fund, ESL Investments. The offer is designed to keep as many Sears and Kmart stores as possible open, as well as ensure continued employment for up to 50,000 workers. It would constitute a questionable reprieve, considering the retailer would need to somehow repay its debts and work its way back to financial solvency against competitive headwinds from e-commerce giants like Amazon and discount retailers like Walmart and Target. While the outcome for Sears is still uncertain — any bid would need to be approved by the bankruptcy court, and creditors may have some objections — the company’s woes point to a larger trend: department stores are struggling. Mall department stores, once a mainstay of the consumer shopping experience, have been beset by problems in recent years. While Sears has suffered some serious self-inflicted wounds, some of the issues that precipitated its downfall are not necessarily unique. At the root of these problems is a familiar story. 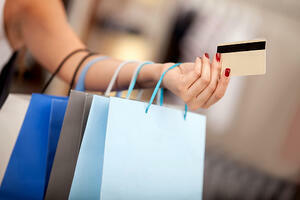 Online shopping is booming, and as a result, mall traffic is declining. 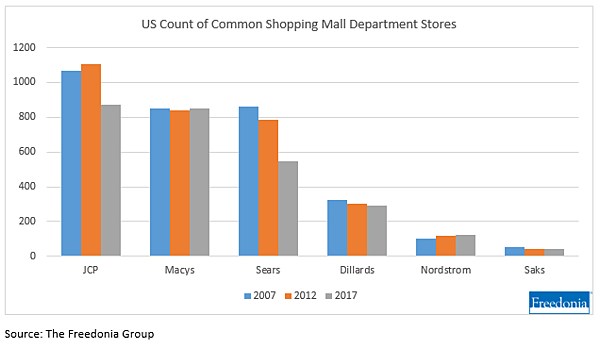 Because department stores often serve as anchors for shopping malls, this reduction in foot traffic is hitting the bottom line hard. Just this past holiday season, Macy’s surprised analysts, achieving much weaker than expected year-over-year sales growth of 1.1% during November–December. Sales for J.C. Penney, another retailer with a history of high-profile misses, declined 3.5% over that same period. Sales aren’t the only thing in decline. In an effort to cut costs and consolidate operations, many department stores have opted to shutter struggling brick-and-mortar shops. This has led to a drop in total store locations for some of the leading US mall department store operators — especially Sears and J.C. Penney, which saw store counts shrink 36% and 18%, respectively, between the period of 2007–2017, according to E-Commerce: United States, a report from Freedonia Focus Reports. By some estimates, the losses from 2007–2017 may increase to the tune of 200 to 400 additional closures in 2019. This spells bad news not only for efforts to save Sears, but for the long-term outlook for mall and other department retailers that are heavily dependent on in-store sales. In a world currently dominated by e-commerce and discount chains, it will be difficult — if not impossible — to keep up without major overhauls. 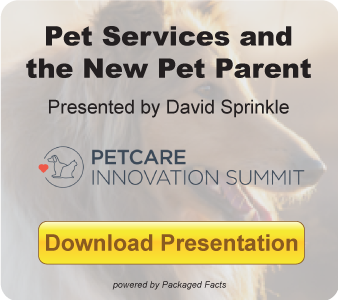 "Some retailers are experimenting with a limited number of stores that serve as a show room, from which you can place an order for the goods to be delivered directly to your home but you cannot purchase things to take home with you right away. I could imagine that Sears could repurpose some of their stores in strategic areas as a place to demonstrate and show appliances and lawn & garden equipment." Should ESL Investments fail to save Sears and the company does liquidate, there is speculation that certain pieces — like the Sears Home Services business or well-known and respected brands like Kenmore or DieHard — could be purchased and carry on even after the company is gone. Whatever the outcome, it looks to be a muted final act for what was once the standard-bearer for U.S. retail. 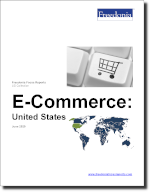 To learn more about the shift toward online retail, including the outlook for U.S. e-commerce retail sales by merchandise lines and type of establishments, be sure to download E-Commerce: United States, a study from Freedonia Focus Reports.